I do like a bit of Hong Kong kung-fu cinema, but I’ve somehow managed to miss out a whole decade in my appreciation of it. What first drew me to the medium were the films of Jackie Chan, and most of his classic films were made in the late seventies and well into the eighties, and I started reviewing them on DVD back in the 2000s, when Donnie Yen was the big draw. Looking at my shelves, there is an absolute paucity of kung-fu action from the nineties, which is a shame as that was when Jet Li was in his element. 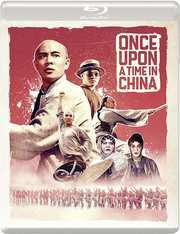 Eureka Entertainment give me a chance to plug that hole in my collection by releasing the Once Upon a Time in China Trilogy on re-mastered Blu-ray, the quintessential nineties kung-fu movies. They’re the films that everyone pointed to as classics of the genre even back then. Tsui Hark directing, Yuen Woo-ping as action co-ordinator, and of course, Jet Li starring, they sparked a revival of the classic kung-fu genre, once more re-inventing the beloved Wong Fei-hung character. Actually, the box says trilogy, but it turns out that there are six Once Upon a Time in China films. Eureka gather the films in which Jet Li took the title role, Once Upon a Time in China 1, 2 and 3, and as a bonus we get Once Upon a Time in China and America as well. 4 and 5 starred Vincent Zhao in the title role, and hence aren’t in this collection. 19th Century China is a global trade crossroads, but China isn’t in a position of strength. The tension between tradition and modernity is matched by the tension between the various foreign powers that vie for influence over China. That’s a position that is made patently clear to Wong Fei-hung, who is a master of a martial arts school in Foshan, a skilled medical practitioner, influential figure in the community, and head of a local militia. Despite all this, the Western interlopers can behave with impunity in the city, as long as they have the favourable ear of the Imperial court. His 13th Aunt returns to China after a long stay abroad, and she has been totally westernised in culture and appearance. All these tensions are brought to a head when the Shahe gangsters start throwing their weight around. After some time away from Hong Kong cinema, especially the kung fu movies of the eighties and nineties, I have to take a little time to get into that head space again. These aren’t films that follow conventional narrative or linear plots. Instead they are a mish-mash of ideas and plot threads, maybe even a few comedy sketches thrown together, and they all somehow come together and make sense by the end of the film. Trying to write a précis of this film’s plot was challenge in itself, but Once Upon a Time in China has often been cited as the best kung-fu film of the nineties. I certainly can’t argue that. Tsui Hark’s direction is fantastic; this feels like a big budget opus. The opening scene of the training sequence on the beach, with a cast of hundreds is breathtaking in its size and elegance. Then you have Yuen Woo-ping’s stunning action choreography, mixing traditional martial arts with weighty wire-work. On top of that you have a great cast. Jet Li is electric as Wong Fei-hung, but you also have a strong role from Yuen Biao as Leung Foon, such that this film feels like a two-hander. The film really sets about capturing a moment, a tone in history. As mentioned, it’s China poised between the old world and the modern age. Wong Fei-hung represents a degree of traditionalism, but even he stands at odds with the Imperial Court, not least because of the way they deal with outsiders. His aunt returns from abroad, having adopted western styles and manners, and one of his disciples, So has spent so long in America that he can hardly speak Cantonese any more. His militia comes up against the Shahe gangsters, whose least crime is the protection racket that they run in the city. Yet the officials blame his militia for the problem. The Shahe have powerful friends, the foreign powers vying for economic control, they’re reshaping China in their own image. Rivalries and mistakes happen between the French, the British, and the Americans, with shots fired, and it’s usually the local Chinese that pay the price when they get caught in the cross fire. Even Wong Fei-hung’s kung fu comes up wanting against bullets. At the time this film was set, the Gold Rush was on in California, and cheap labour was required, and that motivates the villains in this film, the Shahe gang working to supply labourers to the Americans, although their methods are still being used by modern day people traffickers, getting their victims to pay for the privilege of becoming slaves. Naturally it will fall to our heroes to deal with this scourge by the end of the film. If there is an ongoing plot arc tying the film together, it’s that of Leung Foon, who wants to be one of Wong Fei-hung’s disciples, but through a case of comic mistaken identity, winds up on a circuitous path leading to that point, and which actually sets him against his erstwhile master for a period when he hooks up with another practitioner of martial arts. The plot feels haphazard, but it hangs together surprisingly well, and the climax to the film is very rewarding. As the sequel begins, Wong Fei-hung, 13th Aunt, and Leung Foon are travelling to Guangzhou for a medical conference where Eastern medicine meets Western medicine. They also experience the novelty of travelling by steam train. But when they get to Guangzhou they find a city in turmoil. The White Lotus Society has become established there, and they are pushing their agenda of anti-Westernism and anti foreigner sentiment with violent enthusiasm. The local authorities are hard pressed to keep order, and foreigners are being attacked and murdered. Even those Chinese like Wong Fei-hung’s aunt who have embraced other cultures are accused of being demons. On top of this, there are rumours of rebellion being fomented in the city. My first impressions of the sequel weren’t good. They obviously took a budget cut for the second film, made immediately obvious by the sequel reusing the opening credits from the first film (the mass training session on the beach), intercut with some very poor faux train footage. The sets and locations do seem a little more claustrophobic than and not as extravagant as the first film. But that is just surface, as in every other respect, One Upon a Time in China II is the better film. In terms of direction and cinematography it is visibly stronger, the action sequences are even better choreographed and more gripping to watch, and the story is a lot more coherent, and has a tangible direction of travel, unlike the first film which seemed like a random collection of moments that somehow came together for its climax. I wouldn’t have thought it, but the recasting of Leung Foon was a positive for the sequel as well. In the first film, Leung Foon was played by Yuen Biao, and I have to say that there was a little confusion as to just who the star was. It wasn’t a case of clash of personality between Yuen Biao and Jet Li, but a waywardness of writing. But now, Foon is played by Siu Chung Mok, and he perfectly embodies a character who is by turns disciple, sidekick and comic relief, properly second to star Jet Li. It’s a good story, and the rabid nationalism of the White Lotus Society, the violent anti-foreigner sentiment they espouse makes this film surprisingly relevant to the modern era, as more and more populist governments are elected around the world with far right tendencies. The sequel also plays its story close to its chest, introducing its characters, its factions yet leaving the reveal as to just who the villain of the piece is until the final act, throwing a couple of red herrings and misdirections in along the way. One thing it does which is refreshing is that in some ways it’s a mirror of the first film, where the Chinese were innocent victims of foreign influence. Here it’s the foreigners who are the targets, victims of nationalist aggression, and Wong Fei-hung becomes established as a righteous hero of the downtrodden. The action is even better than the first film, genuinely edge of the seat stuff, while the moments of character comedy are judged well and perfectly placed in a film which otherwise can get pretty dark in tone. But as I said, despite the lower material production value, the sequel is slicker in every other respect, and is the better movie over all. This time, Wong Fei-hung, his aunt, and Leung Foon are visiting Beijing, where Wong Kei-ying, Fei-hung’s father is opening a new medicine factory. But it’s also a time of turmoil in the city. The Dowager Empress is intent on proving China’s superiority to the foreigners and to that end is promoting martial arts. A Lion Dance competition has been organised where 10,000 lions will compete to become the King Lion. That much prestige attracts the unscrupulous, and a gangster named Chiu Tin-ba will win no matter the cost. The third film is definitely the weak link in the Once Upon a Time in China trilogy, and that’s despite it changing things up with regards to production values, and the predominant location shooting in Beijing allowing for a different visual aesthetic. But in the end, the story is weaker, and the action is left wanting. The third film just doesn’t have the weight and intrigue of the earlier films, and with the focus on lion dances, both in terms of narrative and in terms of action, its cultural specificity leaves it at something of a remove from broader audiences. There’s just not enough drama in a ‘dance’ competition (and no, I don’t watch Strictly) for me to connect with the story. Of course these are dances where knives, fire, arrows, and kung fu are acceptable moves, but with each of the players cloaked by the colourful costumes, it’s hard to read emotional intent in their actions. We have the usual romantic shenanigans, as Wong Fei-hung’s 13th Aunt wants him to announce their wedding to his father, and at the same time, she runs into a European friend in the city, a Russian named Tumanovsky, which invokes no little jealousy in Wong Fei-hung. Tumanovsky is at the centre of some political intrigue, as the Russians jockey for position in the region, and they have a plan to shift the balance of power in their favour. But the film winds up feeling like two films crudely stitched together as a result, rather than offering two intertwined plotlines. The most disappointing aspect of the film has to be the action, which takes its gravity defying wire-fu to stultifying levels, about as dull and fantastical as those in Crouching Tiger. None of the action feels real or weighty in this film, and it’s a distinct comedown from the previous film. One final thought is the intensity of the lion dances. The costumes are bright and colourful, and look amazingly detailed on this Blu-ray, but the climax of the film in particular, as well as several earlier scenes are just a confusion of colour. I’m put in mind of the opening of Young Master, which kicked off with a lion dance competition, but with just two lions. The action was brilliantly choreographed and easy to follow. It’s a pertinent reminder that more isn’t necessarily better. 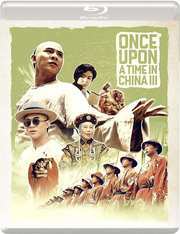 Once Upon a Time in China III is a weak note to end the trilogy on, but this ‘trilogy’ comes with a bonus fourth film! Wong Fei-hung, 13th Aunt, and disciple Seven are on their way to America to visit So and his Po Chi Lam medicine store. The trouble starts even before they get there, when their stagecoach is attacked by Indians, and the three are separated. In town, the Chinese contingent is treated like second class citizens, while the town Mayor is up to some pernicious schemes. Jet Li stayed away for the fourth and fifth movies in the franchise, as well as the TV series, but for the sixth film in the franchise, he did return. Certainly, given its more cosmopolitan story, it would be an important step to a global reach. The following year, Jet Li would be in Lethal Weapon 4, so it obviously did some good. It’s not a spectacular film though, not as disappointing as the third film, but nowhere near the level of the first two. Directed by Sammo Hung (who also co-ordinated the action), Once Upon a Time in China and America is an entertaining, and light kung-fu romp, that has the culture clash between East and West at its heart. Given that the first two films made an effective drama of this dichotomy, you might expect more of the same from this film, but Sammo’s trademark light comedy touch either neuters the drama, or plays it for laughs, exaggerating the cultural friction to ridiculous extremes. It’s enjoyable and it’s entertaining, but it suffers when it come to the English language actors. Unlike the first films, even the Cantonese dub is split fifty-fifty, English and Cantonese, and I’d assume that the English language would have been subtitled for Chinese audiences. The acting isn’t great, the English dialogue is risible, and the performances are directed for a Chinese audience. It will work in China, but for an English speaking audience, the film can be embarrassing at times. These cowboys have to know wire-fu to give our hero a decent enough challenge, but seeing them flying through the air causes a disconnect in the suspension of disbelief. What the film needed was an English cast on a par with the Chinese cast, and direction that would work for both audiences. This wasn’t impossible, and three years later, Jackie Chan would cement his status as a global star when he made Shanghai Noon with Owen Wilson, but Once Upon a Time in China and America is not that film. The films all get 2.35:1 widescreen 1080p transfers and the first three films have recently received 4k restorations for this Blu-ray release. The results are delightful, bringing across the source material without any visible issues. The colours are strong and consistent, detail levels are excellent, and there’s no sign of compression, aliasing and the like. The fourth film’s transfer is a couple of years older, but stands up well compared to the first three films, with just the occasional soft scene not quite up to the same level. But these are four, very well presented films. All the films offer the choice of DTS-HD MA 5.1 Surround English, PCM 2.0 Stereo Mandarin, and PCM 1.0 Mono Cantonese, along with English subtitles. The first two films also have PCM 2.0 Stereo Cantonese up-mixes. I stuck with Cantonese with subtitles for this viewing, and while the stereo was effective on the first two films, ultimately my preference was for the mono tracks, as they sounded richer and fuller. The second film has more issues than normal when it comes to dialogue sync, especially around the middle of the film, but generally the audio experience is solid. The subtitles are accurately timed, but I suspect Eureka have commissioned a new translation for this release. One thing I noted in the first film was So’s sobriquet was Toothbrush; IMDB’s listings call him Buck Teeth So. I hope this isn’t some misplaced sense of political correctness. I only have the check discs so can’t comment on packaging and physical extras, only what’s on the discs. The discs boot swiftly to static menus. The commentaries are all brand new, and the one on the first film is an enjoyable and informative track from Mike Leeder and Arne Venema. The Legend of Wong Fei-hung lasts 12:59, is in 720p, and looks to be a short documentary made to coincide with the film from Star TV. The Interview with Yen Shi-kwan lasts 7:50, 720p and is presented with the actor overdubbed in English. It seems the sole surviving extra from the HKL release is the interview with Jet Li, again in 720p running to 10:35, and subtitled in English. Finally there is the theatrical trailer running to 4:31 1080p. You have a commentary with Mike Leeder and Arne Venema again. Mike Miller: Memories of Once Upon a Time in China II lasts 51:11 in 1080p. The Legend of Wong Fei-Hung II is the second part of that Star TV documentary, and runs to 15:32, 720p. An Audience with Jet Li lasts 10:53, and the Interview with Donnie Yen lasts 16:28. Both are in 720p, and look to be taken from the HKL DVD. Finally on this disc is the Original Theatrical Trailer (3:08 HD). Another commentary from Mike Leeder and Arne Venema is well worth taking in. 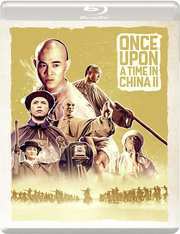 John Wakefield: Memories of Once Upon a Time in China III lasts 29:14 and is in 1080p, newly commissioned for this release. The Legend of Wong Fei-hung III is as you’d expect the third part of that documentary here running to 13:28 720p. The Interview with Tsui Hark (22:56), and Interview with John Wakefield (10:56) are taken from the HKL DVD. The Behind the Scenes Montage lasts 2:51, and really should have been on the first movie disc. Once again this disc is topped off with the Original Theatrical Trailer (2:56 HD). On this disc all you get is The Making of Once Upon a Time in China and America, which runs to 25:05, and offers the usual behind the scenes footage interspersed with interviews with the cast and crew. There are also two trailers for the film. I’m happy now. I’ve plugged that annoying gap in my Hong Kong film experience, and have finally seen Jet Li in his career defining role. Previously, my experience of the Wong Fei-hung character was either with Jackie Chan in Drunken Master (which let’s face it, he played as Jackie Chan), or the kid in Iron Monkey. To finally see what Wong Fei-hung is about, just how much of a mythical/historical figure he is, helps me redefine the context of my kung fu movie collection. Having said all of that, Eureka’s boxset is sweet indeed when it comes to the films’ presentation in high definition, and the useful extra features that come with them. Once more, some of the HKL extra features have been dropped, but the audio commentaries that we do get here, are comparable in terms of interest and entertainment. Only the third film is a disappointment, and while China and America has its flaws, it is enjoyable. The real treat is in the first two films in the collection, and should your find this boxset in your stocking come Christmas Day, you’ll have a grin on your face.